Social media continues to alter the face of revolution after the successful uprisings in Tunisia and Egypt. The revolutions both counties staged against their dictatorships and corrupt governments have taken hold of similar political regimes. Libya used Twitter (before losing access to the site) to bring attention to its own struggle, which has escalated in the last few weeks over the call for Moammar Gadhafi’s resignation. Even China, whose government has incredibly tight reigns over its citizens, has witnessed restrained and Internet-bred attempts to organize demonstrations against the ruling body. Now, neighboring Burma will join the list of oppressed countries looking to challenge its leaders with the help of social media. 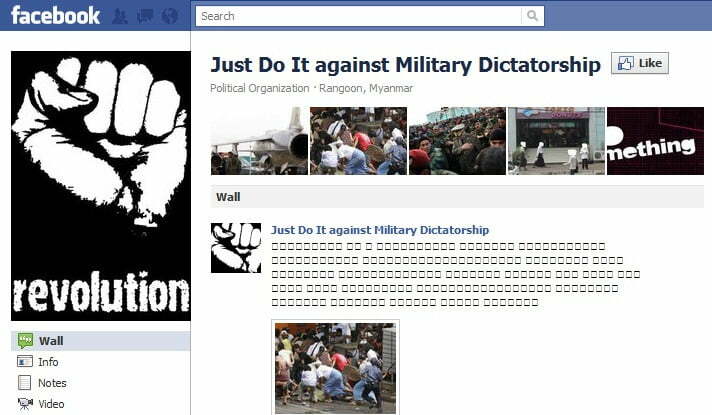 Burmese activists have created their own active Facebook page, named “Just Do It Against Military Dictatorship.” It now has nearly 1,300 followers and boasts a bevy of videos, photos, and discussions. Unfortunately, Burma is subject to extremely limited Internet access, which could be cut altogether if the movement gains any more popularity. It’s listed as being located in the capital, Rangoon, where the Asia Sentinel reports security has already been increased. At the same time as Burmese dissidents establish a Facebook presence, notorious opposition leader Aung San Suu Kyi has been in talks with the US State Department regarding the state of her government. A democratic leader in Burma, Kyi spent years behind bars and under house arrest for her political ideals and aspirations. She also claims that the current regime is closely watching the Libyan revolution as well as the revolutions sweeping the Middle Easter and Northern Africa as well as attempting to censor citizens from any news of the events. But those that have glimpsed the revolutions are inspired. “Everybody is waiting around to see with great interest what transpires because people were impressed with what happened, particular in Egypt,” she told Voice of America News recently. She also said she intends to create Facebook and Twitter accounts as soon as possible. However, she noted there is a large difference between the treatment of people in Egypt and in Burma, which is known for its exceptionally brutal authorities. “Well the people have stood in Burma before as you know and in those instances they were fired upon by the army,” she says.